This Slow Cooker Almond Joy Hot Chocolate takes just five minutes to prepare, yet makes enough to wow a crowd! Whole milk, heavy cream, cocoa and almond extract are whisked together to form this decadently delicious treat. 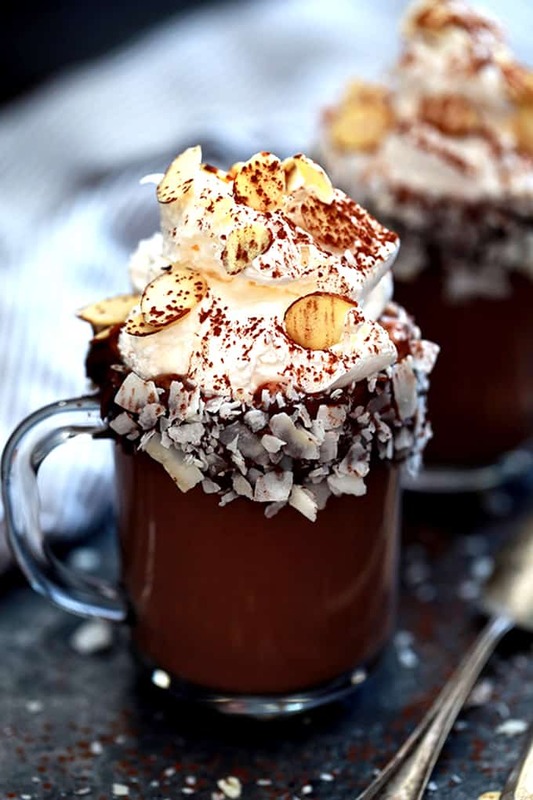 Garnished with whipped topping, sliced almonds and coconut flakes, this hot chocolate is easily the best around. Our Christmas Eve hot chocolate bar was the inspiration behind this decadently delicious Slow Cooker Almond Joy Hot Chocolate. We had gone to church and then came home to enjoy hot chocolate before putting the menagerie and their dreams of Santa’s impending visit to bed. It was awesome to simply walk in the door and have a treat disguised as a drink waiting for us in the slow cooker and I got to thinking, how awesome would it be to do this for other gatherings or parties? I’m thinking this Slow Cooker Almond Joy Hot Chocolate would be perfect for the upcoming Super Bowl or for class Valentine’s Day parties. It also made for a pretty amazing run of the mill Saturday last week when I made it early in the morning and then we enjoyed it throughout the day while simply hanging out in our pajamas. Man, I love days like that! These are such a fun treat for children as they love dressing up their hot chocolate into something truly extraordinary. SIDE NOTE: If you’re looking for an amazing slow cooker, I can’t recommend the one I chatted about in Slow Cooker Pork Roast and Cherries recipe enough. I mean, the fact that it’s non-stick and is a breeze to clean is amazing in and of itself, but it also will brown, simmer and steam as well. To have an amazing hot chocolate, you have to have the best of the best ingredients. Whole milk and heavy cream are paired with my favorite Rodelle Gourmet Baking Cocoa and Rodelle Organics Pure Almond Extract. 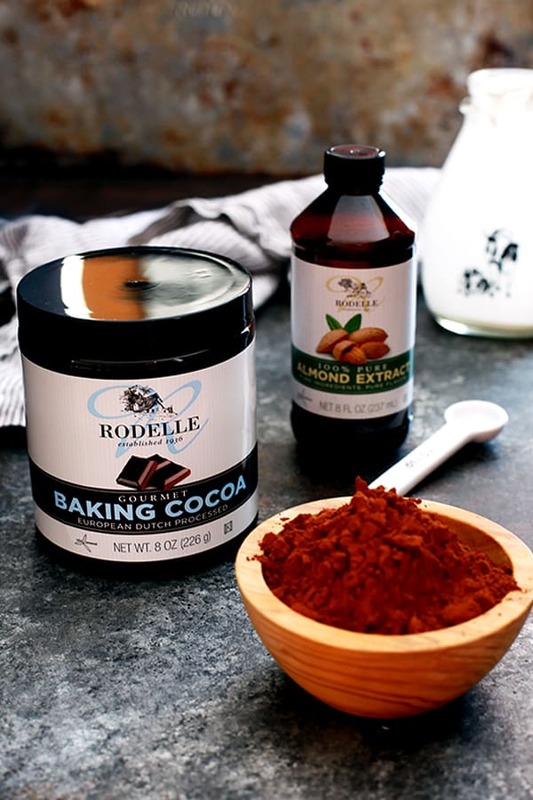 I’m a loyal Rodelle user as the baking cocoa has one of the highest levels of cocoa butter on the market – meaning more chocolate flavor! – and the almond extract contains just three ingredients. No added extras that don’t need to be there! The almond extract in this hot chocolate is honestly the star of the show. Even my six year old could tell there was something special in it that was making it taste so good – not just all the toppings! So grab your slow cooker and the six ingredients needed for this warm weather drink and prepare to wow your family and friends. This Slow Cooker Almond Joy Hot Chocolate takes just five minutes to prepare, yet makes enough to wow a crowd! Whole milk, heavy cream, cocoa and almond extract are whisked together to form this decadently delicious treat. 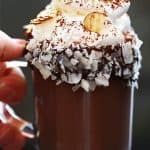 Garnished with whipped topping, sliced almonds and coconut flakes, this homemade hot chocolate recipe is easily the best around. Although the recipe calls for lining the rim of your glass with store bought chocolate frosting, next time I’m going to try substituting my Microwave Chocolate Ganache instead. Talk about decadent! 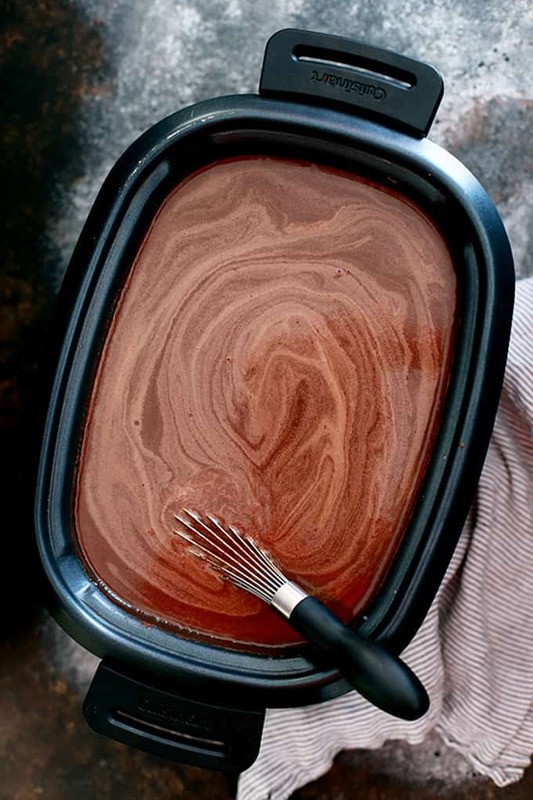 Cook on LOW for 6 hours, whisking hot chocolate every hour to ensure chocolate chips are melting into the hot chocolate instead of burning on the bottom of the slow cooker. To serve, use a table knife to line the outside rim of a mug with chocolate frosting. Roll rim of mug in coconut flakes to coat. 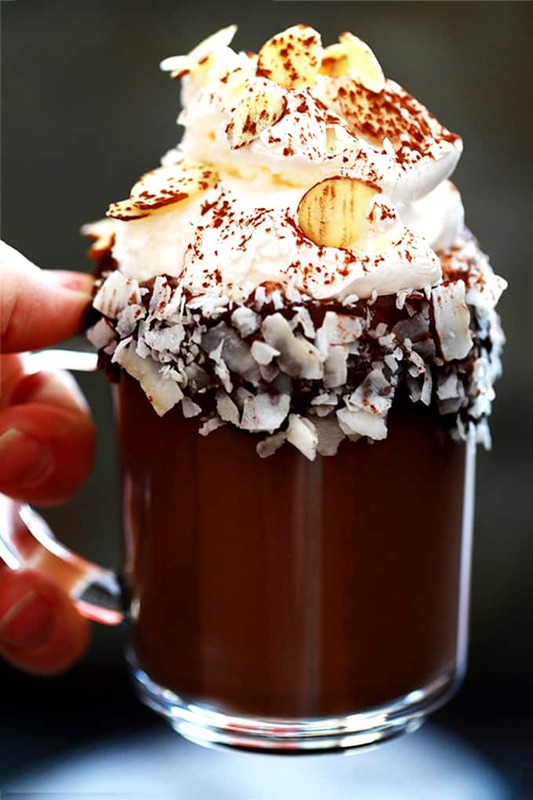 Fill mug with hot chocolate and garnish with whipped topping, sliced almonds, coconut flakes and additional baking cocoa. Adapted from Decadent Slow Cooker Hot Chocolate. While one hot chocolate is good, I say the more the merrier! 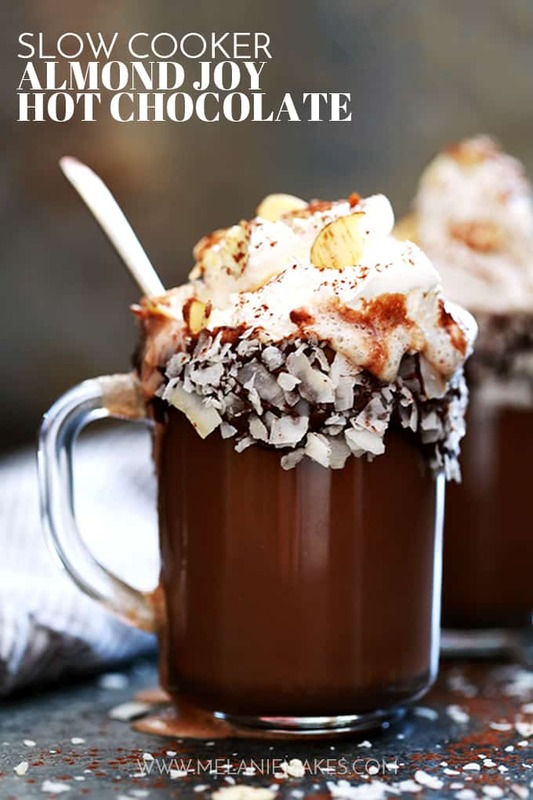 Why not serve a hot chocolate bar with my Slow Cooker Almond Joy Hot Chocolate, my No Sugar Added Chai Dark Hot Chocolate, this decadent Mocha Mudslide Hot Chocolate, an autumn inspired Pumpkin Hot Chocolate or really have some fun with this Hot Chocolate Float. You really could make it festive by serving them all alongside a tray of these Hot Chocolate Cookie Cups. I mean, the possibilities are endless! Wow, that's one decadent and incredible cup of hot chocolate. This is absolutely perfect for the holiday season! I love hot chocolate and this looks amazing! 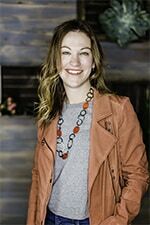 I love Almond Joys, hot chocolate, and using my slow cooker! This was made for me! Oh my goodness, this is absolutely amazing!! A MUST try!! YUM! Perfect for these chilly nights! Oh my goodness! This looks heavenly! Nothing beats a homemade hot chocolate during this season! Talk about a show stopper!! I am having a holiday party and I can't wait to wow the guests with this treat! So easy and definitely serves a crowd! Whoa, this looks amazing! Perfect timing.. I'm hosting a hot chocolate bar this weekend! Perfect timing indeed, Amy - I think your crowd would love this! Wow this is is some serious hot chocolate. Gourmet style for sure. I would drink 10 of these!! Thanks so much, Inci - this hot chocolate is my new fave! You're telling me I can now drink my favorite candy bar!? This is amazing! Cannot WAIT to try this!! Exactly, Karly! It's my husband's favorite as well so it was a definite hit at our house! I'm going to have to really try this! Please do - I think you'd love it! Oh! Yes please! We're big hot chocolate fans! Let me know if you give it a try, Jessica! Oh my goodness, this hot chocolate is SO incredible!! I need it in my life!! Holy moly, that looks SO good - my kind of hot chocolate! It's definitely my new favorite, Kimberly! I'm a big fan of Almond Joy. Brilliant idea turning those flavors into hot chocolate! This is brilliant! Almond Joys are the the candies I always pick out of my kids' Halloween bags, and I can bet that I would be addicted to this hot chocolate. Those are the ones I steal too, Dara!